I am going to link below a list of Islamic Apparel such as thobes, kurtas, kufis, hijabs, and abayas to help you on your path to dressing modestly. I am linking below links for various hadith books for you to check out and hopefully help you on your path to find truth. I would like to share with you one of the great character traits that the Prophet(SAW) had: Patience. The patience of the Prophet(SAW) was exemplified constantly throughout his life and actions. The patience that the Prophet(SAW) had is incomparable to any ordinary human being. As you will see through the narrations. I am linking below several links for you to possibly purchase your own Quran’s to help you on your path to truth. Just click on the links and check out the Quran’s for yourself. I would like to share with you a hadith about Salat-al-Istikhara. This prayer is an extremely important volunteer prayer and it was a sunnah of the Prophet Muhammad(SAW) to do this when he needed Allah(SWT) to guide him towards an action. As an example, my friend used to do Istikhara when he was choosing between classes for college. He told me that whenever he did Istikhara for certain classes the end result was always blessed because he would find out later about the other class option and find that his class was much more suited for him. SubhanAllah. Narrated Jabir bin ‘Abdullah : The Prophet (p.b.u.h) used to teach us the way of doing Istikhara (Istikharameans to ask Allah to guide one to the right sort of action concerning any job or a deed), in all matters as he taught us the Suras of the Quran. He said, “If anyone of you thinks of doing any job he should offer a two Rakat prayer other than the compulsory ones and say (after the prayer): — ‘Allahumma inni astakhiruka bi’ilmika, Wa astaqdiruka bi-qudratika, Wa as’alaka min fadlika al-‘azlm Fa-innaka taqdiru Wala aqdiru, Wa ta’lamu Wala a’lamu, Wa anta ‘allamu l-ghuyub. Allahumma, in kunta ta’lam anna hadha-l-amra Khairun li fi dini wa ma’ashi wa’aqibati amri (or ‘ajili amri wa’ajilihi) Faqdirhu wa yas-sirhu li thumma barik li Fihi, Wa in kunta ta’lamu anna hadha-lamra shar-run li fi dini wa ma’ashi wa’aqibati amri (or fi’ajili amri wa ajilihi) Fasrifhu anni was-rifni anhu. Waqdir li al-khaira haithu kana Thumma ardini bihi.’ (O Allah! I ask guidance from Your knowledge, And Power from Your Might and I ask for Your great blessings. You are capable and I am not. You know and I do not and You know the unseen. O Allah! If You know that this job is good for my religion and my subsistence and in my Hereafter–(or said: If it is better for my present and later needs)–Then You ordain it for me and make it easy for me to get, And then bless me in it, and if You know that this job is harmful to me In my religion and subsistence and in the Hereafter–(or said: If it is worse for my present and later needs)–Then keep it away from me and let me be away from it. And ordain for me whatever is good for me, And make me satisfied with it). The Prophet added that then the person should name (mention) his need. (Sahih Bukhari). We have to realize that there may be options in life that we may want but Allah(SWT) knows that the other option is better for us. So it is better to take council with Allah(SWT) then just take a random choice and mess up something. As Allah(SWT) says, ” . . .But perhaps you hate a thing and it is good for you; and perhaps you love a thing and it is bad for you. And Allah Knows, while you know not.”( Surah Baqrah 2:216). Also what should be mentioned is that the Fuqaha(Jurist) say that if the result is not clear it is recommended to do this up to 7 times. Do not just thing you do this once and it is like a magic 8 ball that tells you what to do. The point of this is to get inclination towards an option. So insh’Allah we all take this knowledge and actually use it to our advantage. Insha’Allah Allah(SWT) will forgive us, guide us, protect us, and give us all Jannah-al-Firdaus. I would like to share with you one of the great sunnah’s of the Prophet Muhammad(SAW). It is to wear a turban. This may be simple, but every sunnah of the Prophet Muhammad(SAW) is extremely important for many reasons but the big reason is due to the prediction our Prophet(SAW) has made that has surely come to true. Since I, myself, have witnessed this. Now back to the Sunnah of the Turban. Here are some hadiths which relate the benefits and importance of this Sunnah. Insha’Allah we all can take upon ourselves and try do one more sunnah then usual because that action could be the very action to lead us into the Path of Allah(SWT). Insha’Allah we all ask Allah(SWT) for forgiveness, guidance, protection, and Junnah-al-Firdaus. I would like to share with you a beautiful hadith that talks about seven types of people who will be under the shade of Allah(SWT). We have to put things in persepctive though to understand how lucky and honorable it is to be part of this shade. The day of judgement for the average person is going to be terrifying due to the fact that all his deeds, good and bad, as small as an atoms weight will be seen. As exemplified in the last two ayats of Surah Zalzalah: “So whoever does an atom’s weight of good will see it, And whoever does an atom’s weight of evil will see it.” (99: 7-8). As you can see it will be a terrifying time because we are being judged on every single action while the sun is scorching us. However, there are seven types of people who get shade on the day of judgement. Insha’Allah we all strive to be one of these seven people, we ask Allah(SWT) to give us Hidaya(guidance), protection, forgiveness, and Junnah-al-Firdaus. I want to write about the benefits of reciting and knowing Surah Ta Ha. As you can see that there are many benefits to reciting and knowing this Surah. So to protect ourselves and to prepare ourselves let us try to learn more about Islam and pick up the Quran more often. Below is a link for you to purchase your own Quran, and please explore our shopping page. I would like to share with you two ayats of the Quran which talk about what Firawn(Pharaoh) did right before he drowned in the ocean and what Allah(SWT) did for a sign of all humanity: Allah(SWT) preserved Firawn’s body which was discovered a couple years ago and lasting for thousands of years. “And We took the Children of Israel across the sea, and Pharaoh and his soldiers pursued them in tyranny and enmity until, when drowning overtook him, he said, “I believe that there is no deity except that in whom the Children of Israel believe, and I am of the Muslims. Now? And you had disobeyed [Him] before and were of the corrupters? So today We will save you in body that you may be to those who succeed you a sign. 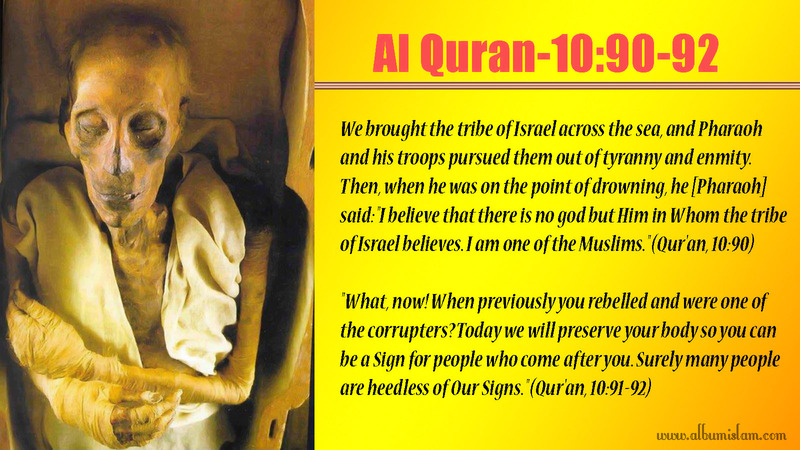 And indeed, many among the people, of Our signs, are heedless.” (Surah Yunus 10: 90-92). As you can see in the picture and video how Firawn’s body has been preserved over the years for us. Firawn’s body, as of now, is on display Royal Mummies Chamber of the Egyptian Museum in Cairo. What a beautiful prophecy that was fulfilled. Insha’Allah we all ask Allah(SWT) to forgive us, guide us, protect us, and enter us in Jannah-al-Firdaus.